Pinus rigida is an evergreen gymnosperm tree to 20 m, ca 200 years; trunk often crooked, habit irregularly pyramidal, gnarled with age, bark flaky, rough, dark, twigs brown, rough, leafy short shoots often sprouting from trunk and larger branches, able to resprout along trunk and branches or from base after fire; easily overtopped by hardwoods when fire is suppressed for many decades. Roots obligately associated with mycorrhizal fungi, especially Pisolithus tinctorus in sterile, sandy soils (Allen 1991). Leaves needle-like, in bundles of 3, stiff, dark green, slightly curved or twisted, usually shorter than those of black pine, to 12 cm long,, 0.2 cm wide, persisting 2-3 years. Flowers: None. Gymnosperm. Monoecious; male cones yellow, clustered at ends of branches, deciduous; pollen shed before female cones receptive. 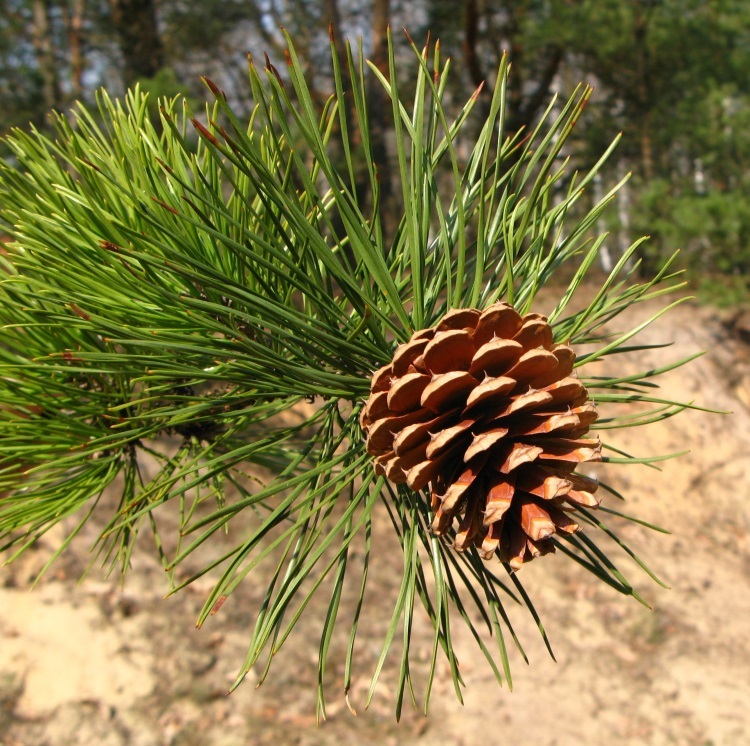 Young female cones green or often red, mature at end of second season; cones broad, short, 4-7 cm, scales thick stiff, spine-tipped, very persistent. Fruit: None. Seeds winged, eaten by many birds (probably voles also) (Martin 1951). Seeds need open soil to germinate, especially spring following a fire. Many trees have cones that do not open without heating (serotinous). Frequency in New York City: Infrequent. Reproducing on at least one site. Habitat: Intolerant of: alkaline soil, shade (index 0-2), flooding or saturated soil for more than 25% of growing season; soil compaction. Tolerant of drought, relatively resistant to salt spray, adapted to sterile sandy soil, pH 3.5-5.1 (Hightshoe 1988; USDA, NRCS 2010). Notes: Young bark and leaves eaten by rabbits, squirrels, mice (Martin et al. 1951) Susceptible to sweetfern blister rust, Cronartium comptoniae (Basidiomycotina) which uses sweetfern (Comptonia peregrina) as a secondary host, can girdle branches or sapling trunks. It shows as swellings or cankers on stems; Ploioderma lethale (Ascomycotina) kills needles, the disease is apparent as yellow spots and bands on needles during the winter, causing needles to die during the spring; Heterobasidion annosum (Basidiomycotina) causes root rot, the fruiting body is a white bracket fungus near the tree base; Phellinus pini (Basidiomycotina) causes heart rot, the fruiting body is a dark, woody bracket fungus (Agrios 1988; Burns and Honkala 1990; Sinclair et al. 1987). Twig tips destroyed by larvae of Rhyacionia zozana and R. frustrana, pitch pine and Nantucket tip moths respectively; Lambdina pellucidaria, the pitch pine looper, and several species of saw fly larvae, Neodiprion spp., eat the needles and can defoliate and kill the tree (Johnson and Lyon1991).